Fantastic New Year Breaks in 2014! 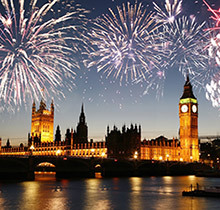 As midnight approaches the banks of the River Thames begin to fill with people as the firework display rings in 2015. After which a friendly chorus of Auld Lang Syne will play and those around will wish each other well for the coming year. The following day there is a New Year’s Day Parade many coach packages will include visiting this before journeying home. Affectionately known as Hogmanay, you can ring in the New Year in style with a coach holiday to Edinburgh at New Year. The streets of Edinburgh come alive with the Hogmanay Street Party, with live musical acts and DJs, at midnight fireworks erupt over Edinburgh Castle. These fireworks are shown around the world from Sydney to New York. What could be more magical than seeing in the New Year in Disneyland Paris, amid thousands of twinkling fairy lights and a blanket of crystal white snow. 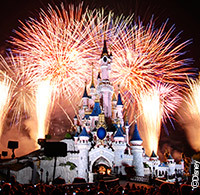 After dark enjoy a fabulous midnight firework display over Sleeping Beauty’s Castle, 2015 will definitely get off to dreamlike start! Venture to the city of light to celebrate ‘Bonne Annee!’, unfortunately there is unlikely to be any official fireworks but the atmosphere will still be electric and the Eiffel Tower will be dressed for the occasion. Celebrate the New Year by immersing yourself in the atmosphere of the French Capital and don’t forget at midnight those in France will celebrate by exchanging kisses on the cheeks! We have plenty of other great location to spend New Year including Lllandudno in Wales, Blackpool, Southport or for something a bit different, Iceland!